In 1942 German merchant Philipp Manes and his wife were ordered by the Nazis to leave their middle class neighborhood and go live in Theresienstadt, the only so-called “showpiece” ghetto of the Third Reich. This model ghetto was set up by the Nazis as a front to show the world that the Jews were being treated humanely. The ghetto was run by a council of Jewish elders, and organized like an idyllic socialist utopia with theatre groups and debating societies. All the while, this was just a holding post for Jews being shipped to forced labor and certain death at Auschwitz. Philipp Manes’ intimate diary is filled with fascinating details of everyday life in the ghetto. Manes’ voice brings us a step closer to understanding a little-known aspect of one of the most painful periods in the history of mankind. The editors Ben Barkow and Klaus Leist are both historians based at the Wiener Library. 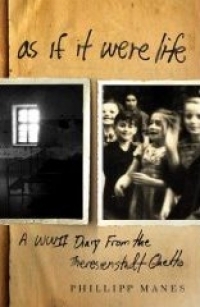 The eyewitness account of Philipp Manes offers a unique insight into the life of the Jewish ghetto of Theresienstadt and the cultural activities that flourished there and helped people to endure a cruel and ultimately fatal situation. The publication of this excellent translation of Philipp Manes’s Theresienstadt Chronicle makes accessible a hugely important document of the Holocaust. Manes’s prose is eloquent and elegiac, and his attention to detail careful. This unique account is essential reading for anyone interested in comprehending how the victims of the Third Reich sought to negotiate life in one of its least well-understood institutions of persecution. The murder of European Jewry had many facets. Terezin in Bohemia was the de luxe showcase (transit)camp scheduled to hoodwink the Red Cross and similar organizations. This diary by an elderly German Jew who had a leading position there is one of the most authentic documents helping to understand the sho'ah. The publication of Philipp Manes’ diary is an extraordinary event and its significance in historical and literary terms can hardly be overstated. . . . It is above all the courageous directness and freshness of this record, its spirit never faltering in the face of misery, which affects the contemporary reader most strongly. . . In the midst of incessant suffering, art and theatre acquire an ability to transcend, thanks solely to the power of words. This power makes itself felt in Philipp Manes’ diary, which is arguably the most important reason why this book deserves to be read today.